Improvisational genius … Amy Winehouse at the Mercury awards in 2004. The beehive hairdo and dramatic eyes, the sultry, jazz-infused voice, the public battles with addiction and law enforcement. One year after her tragic death, what remains of British retro-pop diva Amy Winehouse are the songs that brought her five Grammys and a plethora of powerful images and memories, of a talented rebel stalked by the tabloid press, haunted by fame and driven by self-destructive impulses. Winehouse was often her own worst enemy, facing frequent battles in court for assault and drug use, with many unflattering images of her, disheveled and out of control, used to sell tabloids. The tragedy of her life was driven home again earlier this summer with the release of Mitch Winehouse’s well-regarded Amy, My Daughter, a memoir of a father’s struggle with an addicted, famous and famously troubled daughter. “She (Winehouse) was a lightning rod for attention, whether by design or accident, because of her lifestyle. She would have been a magnet for that sort of thing even if she hadn’t been such a train wreck in real life,” said music journalist Alan Cross, host of radio show The Secret History of Rock. Finally, Cross noted, Winehouse died at the age of 27 — apparently of alcohol poisoning — placing her in the macabre and exclusive “27 Club,” alongside such legendary performers as Janis Joplin, Jimi Hendrix, Jim Morrison and Kurt Cobain. “There’s a certain mystical legendary status that’s been bestowed on her. I’m not really sure why or if it’s deserved after just two albums, but obviously the music that she made and the life that she led certainly affected an awful lot of people,” Cross said. While fans around the world will mark the sombre one-year anniversary, a group of Toronto musicians are hosting a special tribute on Monday at 8 p.m. at the Orbit Room (580 College St.). Toronto singer Emma-Lee, who organized the event, and four other performers — Saidah Baba Talibah, Treasa Levasseur, Tanika Charles and Tia Brazda — will each perform three Winehouse songs, backed by a team of musicians: Tyler Emond on bass, Matt Giffin on keyboard, drummer Sly Juhas, guitarist Tom Juhas, Chris Gale on tenor sax, Alison Young on alto sax and Steve Dyte on trumpet. With a suggested minimum donation of $10, proceeds for the event will go to the Centre for Addiction and Mental Health. 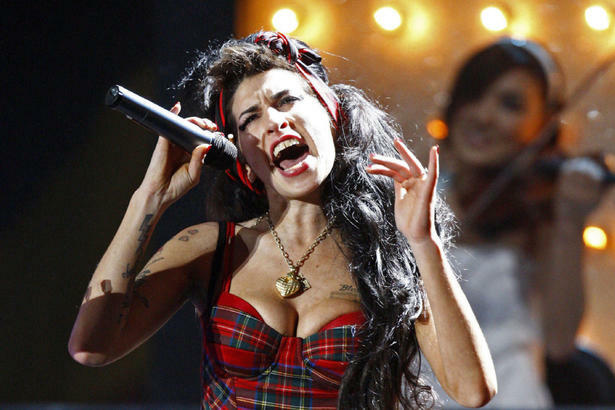 Emma-Lee said it was important to do something to commemorate Winehouse’s passing and enduring musical legacy. “It started just as a personal thing because I’m a big Amy Winehouse fan. It’s important to remind people more about the contributions she made to music and less about the terrible things she endured in her short time here,” Emma-Lee said. When she approached CAMH with the idea, they “came on board right away,” she said. Amy Winehouse performing in 2008. “I think they would be crazy not to. Here you have all of these musicians who are willing to get together and do it for the love of music and raise money for other people who are struggling with mental illness or addiction,” Emma-Lee said. CAMH spokesperson Michael Torres confirmed the centre’s enthusiastic support. “These events are a big part of what we do here because it’s a way that people in the community can give back,” Torres said. Emma-Lee said the event is in no way intended to be exploitive.